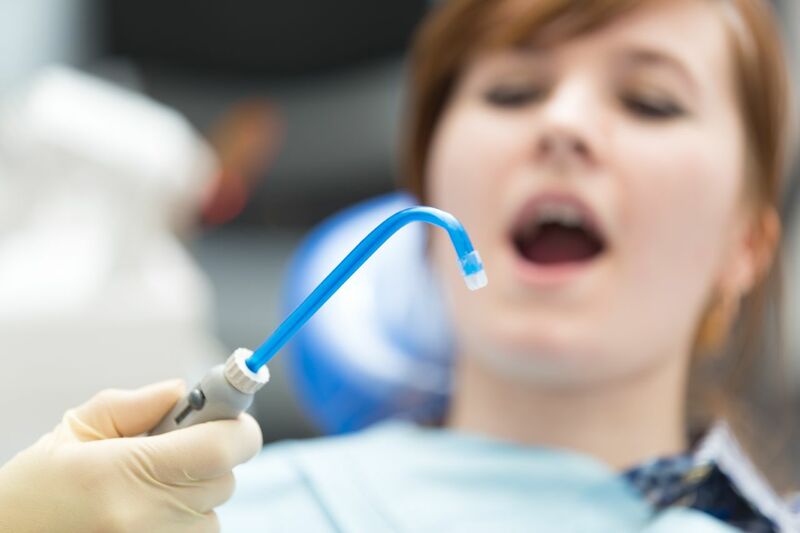 When it comes to our routine dental visits, many of us will face some potential jitters, but there's another common thing that most of us also will do: we close our lips around the suction straw during our dental cleanings or procedures. Most dental patients probably have experienced the awkward and sometimes slightly painful sucking and squeezing of the straw against the inside of their mouth, as the dental hygienist attempts to extract every last bit of saliva. Personally, my hygienist instructs me to close my mouth to allow the suction straw to do its job fully. Similarly, when we visit the pediatric dentist, my children are told to do the same, or to "close," so the saliva can be swiftly removed. We do this routinely because -- particularly when we're at the dentist -- we usually do what we're told. However, there is a very good reason to think twice about this seemingly routine or harmless practice. In fact, it's important to say, instead of doing what you're told when you're instructed to "close," you're better off being more aware of something called backflow. In simple terms, backflow refers to the germs and other debris -- such as saliva, blood, and viruses -- that build up in vacuum tubing and can actually back up through the straw and into our mouths. Research shows that backflow like this occurs in about one in five patients who close their lips around the suction straw. Most people are completely unaware of the risks associated with backflow, but the risks are fairly well documented. According to the Centers for Disease Control and Prevention, backflow from saliva ejectors occurs when the pressure in the patient's mouth is less than it is in the evacuator. When patients close their lips and form a seal around the tip of the ejector, a partial vacuum occurs. When it comes to cleaning dental instruments, the frequency and technique used by dental offices varies widely. Some dental technicians are taught to clean dental instruments with great rigor and consistency, while others may not be expected to implement these same important skills. When it comes to cleaning the interior of suction devices, it can be very challenging and time consuming. For example, think about a basic drinking glass you use at home. If it has tomato juice in it, for example, and sits out overnight, the interior of the glass gets very dry, crusty, and difficult to clean. Most likely, you'll need to soak it for a while, and then scrub it aggressively to get it clean. The interior of the valves that connect the evacuation straw to the vacuum tubing are no different, except in the case of these dental valves it's not tomato juice you're dealing with, but blood, saliva, infected tissue, and more. Depending on the infection control practices of any dental office, this contaminated brew may be allowed to build up daily, weekly, monthly, and unfortunately, even over the course of a year. Look at your dentist's office and the rooms where the patient procedures take place. Are they free of clutter and mess? The more clutter or "stuff" you see, the more the chance for contamination and germs to make their way to you. Learn about whether or not your dental office complies with cleaning evacuation lines. Ask how frequently they flush these lines. At the very least, you should hope they flush at least daily, if you hear that they flush between patients, all the better for you. Ask if your dental office uses backflow prevention devices to keep you and your family safe. Ask if your dentist or dental technician might let you see the inside of the dental suction valve. Anything but a perfectly clean valve is unacceptable. The saliva ejector valves often rest on your face or neck area. You deserve the cleanest instruments possible. If you find that your dental office is meeting or exceeding these expectations, make sure they know you recognize and value their efforts to keep their office and equipment contaminant free... and you and your family safe from germs and disease. When it comes to our dental care, we've all come to expect our dentists to use the latest in dental technologies -- things like fancy 3D imaging machines and impressive in-office crown making equipment. There should be no lesser expectation for infection control. Today, both patients and dentists alike can benefit from new infection control technologies -- for example, new disposable dental product options for equipment that previously was only available in metal and had to be cleaned with great care vs. simply disposed and easily replaced. Infection control should be just as important -- if not more so -- when it comes to our dental care.